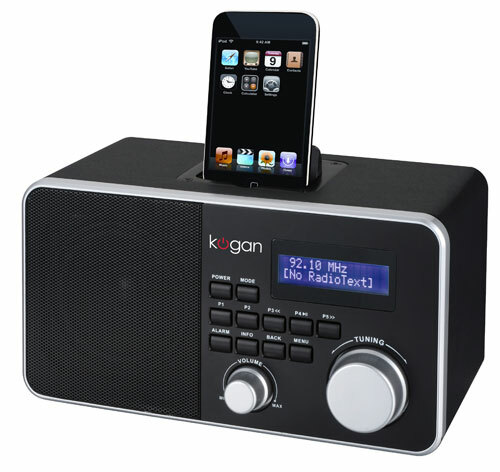 The Kogan Digital Radio tries to pack as many different features as possible into 1 low cost device including: DAB+ broadcast digital radio, FM analog radio, WiFi streaming radio & podcasts, iPod Dock, USB slot and streaming music directly from your PC via shared network folders/drives. Styling: Black case and front with silver Volume and Tuner/Select Knobs. Display: 2 lines. Cannot adjust or turn off backlight. In my opinion it’s too bright for night time use as an alarmclock unless you put something in front of the screen to block the bright blue glow. EDITOR: Kogan tells me that the the screen brightness is not adjustable in the user menu. However, it can be initially be set to different brightness levels during the manufacture stage so leave a comment here if you think its too bright and they might change the next batch sold. Buttons: Do the job but not styled very much. Large enough and well spaced so it’s easy to differentiate between them with fingers in the dark. The “Info” button is useful because it cycles between Signal Strength, Bitrate, scrolling datastream (news updates, current song) etc. DAB+ Radio: Picked up all the Sydney stations and displayed the digital radio station datastream eg: current song name, weather forecast, news headlines etc. To be honest I can’t tell any sound difference between FM analog radio and digital radio, the main benefit of digital radio is new stations like ABC Grandstand Sports, NovaNation, SBS6 (BBC World Service), TheEdgeDigital etc. WiFi Radio streaming: Took a few minutes to setup because I had to enter my WiFi network SSID, WPA2 key etc. After that it worked fine and it was easy to use the tuner knob to navigate the countless (1000’s?) of different streaming radio stations worldwide from big broadcasters like BBC, NPR etc as well as the independent music and other online radio stations. WiFi Podcasts streaming: Worldwide podcast list navigation is easy. Pauses for a while as it downloads the specific podcast episode you want to listen to. However you can’t pause a podcast once started eg: if you get a phone call. Makes this feature less than useful. Shared Folder MP3’s from home network: Easy smooth navigation around subfolders using the large select Knob and “Back button”. Unfortunately not possible to play Random/Shuffle. 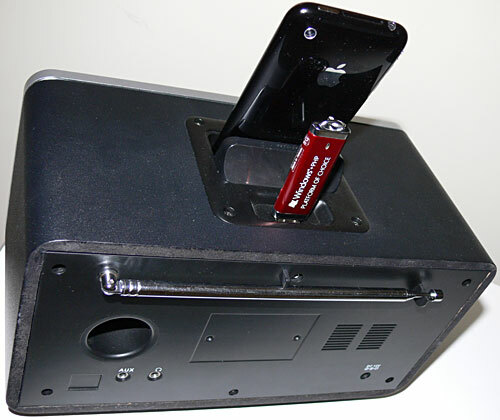 USB slot : Tested with 8GB usb drive completely full with MP3’s. Played songs with no issues. Cannot view song ID3 details. Pressing “Detail” button during song playback cycles between display of: Current Time, Current Date, Filename, File Path. Unfortunately not possible to play Random/Shuffle. Speaker: 7W RMS Mono. Quite good enough for listening to spoken voice podcasts and talk radio. Strong enough to turn up the volume and listen from across a big open area without distortion. Suggest plugging in proper stereo speakers into the headphone jack if you listen to music often. AUX input: Tested with Sandisk e280 Mp3 player and worked fine. Output 3.5mm headphone jack: Instantly switches audio output to external speakers/headphone as soon as they’re plugged into the radio. Alarm Clock: 2 Alarms with choice of sound (Buzzer, DAB+, Wifi radio or FM radio). Lacks some high end features like Live digital radio buffer to pause and rewind but to be fair very few digital radio’s on the Australian market at present have this feature. Stereo speakers, Digital output and 4 Line display would be useful. But in the end lets not forget that adding these features would greatly increase the price and this Kogan Digital Radio does pack in a lot of good features at a sharp price of $169+shipping ($187.43 total). I have also reviewed several other digital radio’s from OXX Digital and PURE Australia. I am a radio junky so am interested in digital radio, but I think it is only available in capital cities. I am a Radio National fan but it goes out on AM and most digital radios don’t support AM. I don’t suppose you have any idea when digital radio will be rolled out to rural areas. That’s pretty steep for a glorified clock radio. Might there be any such thing as a “set top box” for digital radio that would be capable of receiving digital signals, reprocessing them and re-transmitting them as AM (or FM?) signals to be captured by an AM receiver? I have a Denon 1906 receiver that receives some AM signals (eg FiveAA 1395 in Adelaide) very pooly. Just got my Kogan today. DAB+ is excellent. Unit is excellent. VERY Happy. But the internet radio…..WOW!!!!! DELIGHTED at the easy functionality. Audio is not quite as good as DAB+, but it also doesn’t need an ariel and doesn’t drop out. I navigated to (internet) ABC Radio National and the Kogan gives you the choice of live or podcasts. OK…what’s podcasts? EXCELLENT….that’s what!!!! It loads a list of currently available podcasts from that station……just select one and off you go! WOW!!! If you miss a program you just select it and listen on demand. It’s so easy. Am very happy with purchase – build quality, ease of use etc. Audio of unit is nice for spoken word – nice and resonant, plenty loud enough, no amp hiss. Music, meh, but I will have it going though an amp and speakers. DAB+ channels are going to need a bit of ariel tweaking/boosting, but that is due to the fact that my unit is on the coast and facing the ocean. The unit should have an ariel socket, but I think I will get away with a wire extension to the antenna. Mostly it’s OK, but in some locations in my unit the channel drops periodically. Summary….delighted with Kogan – was concerned about it turning out “cheap yum cha”, but have to say that it knocks the spots off the feel of a Pure unit more than twice the price (which doesn’t have wifi etc). If you listen to music, use an external amp/spkrs. Otherwise nice sound for voice. Mono is about the same as stereo in a small unit – can’t see the point of stereo speakers only a few centimetres apart – no better than mono, in my book. DAB+ is great, however, after 30 minutes of ownership of this unit I am convinced that DAB+ is nice, but probably obsolete in a few years; internet radio is the main game for any home with WiFi – the instant access to live radio or a vast range of podcasts is just brilliant. Why bother with DAB+? One downside of Kogan – seems to forget everything when the power is interupted. Why do most DAB+ radios have screens which you can’t dim the display?!. This is a major downside to anyone wanting to use one as a bedside clock radio. Has anyone bothered to question wether or not 99% of the DAB+ radio and DAB Radio alarm clock designers seem to be clinically insane or just plain stupid. Most of the designs I’ve seen and read about are absolutely shocking and look like throw backs to the early 1980’s Dr.Who shows (no offence Tom Baker – Legend!). Not having dimable screens, small speakers, menu systems to confuse rocket engineers and are all in all basically just old crap. Be nice when one day customers can get decent, well designed products that are simple and intelligent to use and don’t look like a kid’s toy! Can anyone report on the quality of audio when connected to a home hi-fi via the headphone jack, playing IPOD and Internet Radio? I am considering this unit instead of an IPOD docking unit (with audio output jack) to connect to my Hi-Fi, I use internet radio on the PC a lot so I’m leaning towards this unit if it will handle the IPOD – HiFi connection ok. I received this digital radio last week, and really like it. I bought it when they had a $50 off sale for 1 hour on 5th of December! I have a set of amplified computer speakers plugged into the output jack so I can listen in stereo. I agree that the screen is too bright because I tend to fall asleep listening to the radio and don’t turn it off. I guess I should just use the sleep function, but I do wish the screen brightness could be changed. The only other issue isn’t related to the radio itself but the fact the broadcasts use quite low bitrates. For example the easy listening station in Adelaide Cruise 1323 broadcasts at just 48 Kbps, when at least 64 Kbps would be better, and 80 Kbps preferable. The codec used is AAC, which is the latest and greatest lossy codec for lowbitrates. Generally ABC talk stations (NewsRadio, Radio National, Local Radio) are broadcast at 48 Kbps, while 80 Kbps is reserved for Classic FM, Dig Music, and ABC Jazz. For those who want to dim the screen Im sure it could be acomplished fairly easily. Unfortunatly you will have to open it up which will probably void your warranty, but some might be happy to give it a go. I havent done it myself but in my experience there is usually a pot (variable resistor) on the back of the display that you simply turn up or down using a screw driver. There should be only one pot. That should up or down the brightness. There may be mains voltages present inside the box so make sure you take care and if you arent sure dont try. If you open it up but arent sure take a photo and let me know and I will try to spot something. If it does work please post back to let others know. This unit looks great as a replacement for my TDK ipod dock clock radio & Pure internet radio (no out put jacks at all) it realy seems to tick all the boxes and is at a affordable price point. I want to order one once I get approval from the wife. Both my current units also have these over bright blue displays, the remedy I found is simple, cheap & won’t void your warranty.. red cellophane, available at news agents, fold it if you need to depending on how much dimming is required, cut it slightly larger than the size of the display and run cello tape around the edge to seal in the peripheral light. No more sleepless nights! Mine doesn’t seem to be as bright as what it was when I bought it in December (see my above comment). There have been two firmware updates released since I bought it, but I haven’t noticed any radically new features. Delivery is useless and not 24hours, 3days before carded. Kogan disallows signature to leave freight and disallows redirecting the package. Toll will not redeliver the next day after been carded. $135 delivered. Its not a gold bar, what are they thinking puting such onerous conditions on a delivery apparently worth $119. We’re very sorry you’ve had issues with the courier service. To clarify, we do allow Toll to leave unattended deliveries, for you to do this you need to give Toll authorisation to do this. Also, we are able to redirect courier delivers at any time, if you’d like to do this please contact [email protected] and we’ll be more than happy to help out. This speaker is quite cool. For that price it is not that expensive. Reading the comments about not being able to dim the display, how about sticking a post it note over it just before going to sleep?